When you've seen many Sears houses in real life, you brain subconsciously registers the standard sizing and proportions that are used across the Sears models. I always encourage the people who attend my talks to visit the Sears homes in their community in person. Seeing houses on the Internet or on this website is not the same thing, and I find that it is much easier to identify a model after having seen the details in real life. I recognized this as Sears house from the back when I was leisurely strolling around Park Ridge one day. Just something about the proportions or the line of the roof... When I walked around the block I discovered it was a Sears Maywood. 9 Gillick St., Park Ridge. 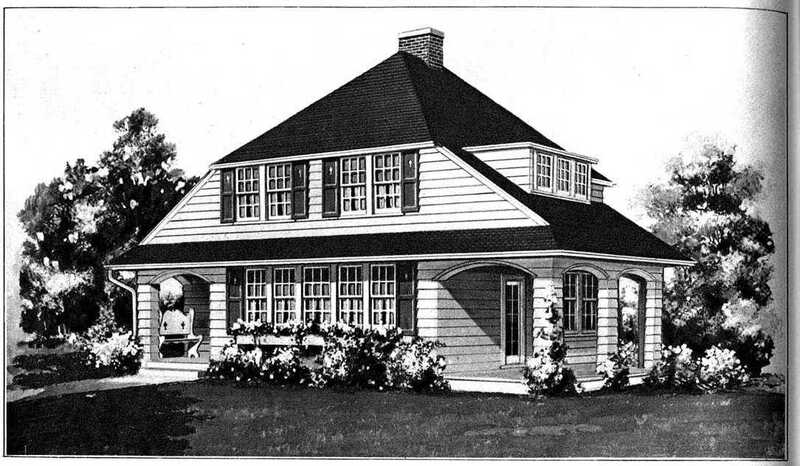 The Sears Maywood form the 1926 catalog. Scan courtesy of Sears Archives. You can see the original three-window dormer on the side. The Sears Maywood was first sold in 1927, and this one was built between 1927-1929. I believe the original owners were Leon and Mae Fiset. Leon was an embosser. Leon died in 1933, and Mae moved to Chicago around 1935. I saw one of these on my trip this summer --- well, it's on a list of possible kit homes in that town. I have photos. I'll have to share with you. I also passed by one (possibility) in another town while out east-- I'll have to show you that one, too.